Blooming orchids looks like it would be a super hard project but it's not all that you would think and much easier if you follow a few great tips. For the best success choose the right one for your conditions and the watch them grow! It's hard not to just pick the one potted orchid that you think will look the nicest. But, it's better to take into consideration the conditions your home has to offer. Light, temperature, humidity, and more. 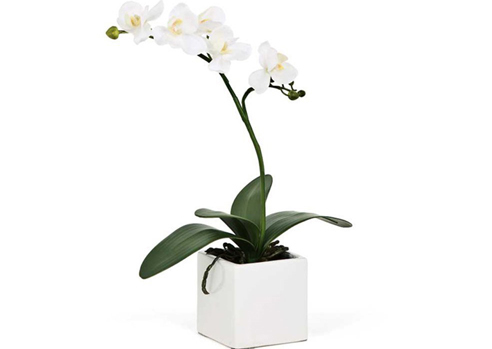 Of course, you need to pick a great container to compliment the stunning beautiful orchid. Keep in mind that they will need re-potting so while you may want to spend big bucks on a beautiful flowerpot maybe hold back a bit. Clay pottery is still the most recommended because it breathes and is the healthiest for strong root systems. However, you can use other pots but just make sure you follow some of the tips below. Light is the most important variable since most orchids prefer high light and streaming direct sunshine. Some varieties grow in med light which means bright but not direct sunshine. While others will grow in med low light you will need to have northern exposure to help with reflective light properties. Temps should be cool, warm and humid if possible. Make sure you select the correct one. We all know orchids are considered tropical so grouping them together or placing them on a saucer with stones on it to support the roots up out of the standing water. As the water evaporates it acts like a humidifier for the potted orchids. 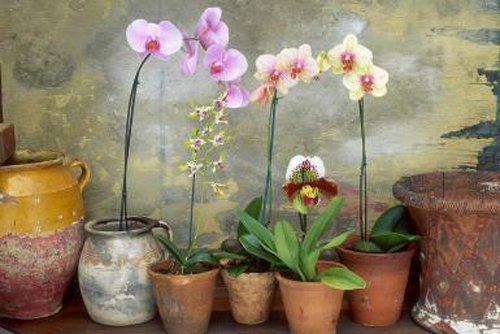 Water is tricky because most of what you pour on the orchid runs out the bottom of the pots. It's best to submerge the pot in a bucket of water for 10 mins so that the mix can absorb as much water as possible. Using a clay pot will help keep the mix moist. Fertilizing is easy since most aren't heavy feeders. But try to delivery fertilized water at least once a month. What's the easiest potted orchid to grow? Moth Orchids. The blooms last for months once they bloom but these will re-bloom. 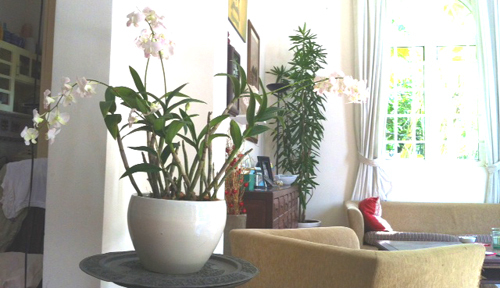 Care for your potted orchids and they will continue to amaze you with their beauty. Read more..... Stop animals from nibbling. Read more..... Soil in containers.